The hybrid sensor network is mainly composed of static and dynamic sensor nodes. The dynamic node is the mobile robot with wireless sensor module installed. This paper proposes a robot navigation algorithm based on sensor technology and iterative maximum a posteriori estimation. It uses Kalman filter and least-squares fitting to improve RSSI measurement accuracy and the mobile robot only needs to use the received signal strength (RSSI) and odometer information to realize autonomous navigation in the sensing area. Moreover, static nodes are randomly deployed in the sensing area without a priori location information. Therefore, this algorithm has the advantages of low cost and ease of deployment. Both simulation and outdoor field experiments show the performance and effectiveness of the algorithm. N. Zheng, Y. Du, and Q. Bai, “Robot Navigation Algorithm Based on Sensor Technology and Iterative Maximum a Posteriori Estimation,” J. Adv. Comput. Intell. Intell. Inform., Vol.23, No.2, pp. 282-286, 2019. S. Misra, S. Chatterjee, and M. S. Obaidat, “On Theoretical Modeling of Sensor Cloud: A Paradigm Shift from Wireless Sensor Network,” IEEE Systems J., Vol.11, No.2, pp. 1084-1093, 2017. H. A. A. Alasadi, “Energy Efficient Hierarchical Clustering Mechanism for Wireless Sensor Network Fields,” Social Science Electronic Publishing, Vol.153, No.8, pp. 42-46, 2017. W. Pawgasame, “A survey in adaptive hybrid wireless Sensor Network for military operations,” IEEE Defence Technology, pp. 78-83, 2016. J. Forsberg, U. Larsson, and A. Wernersson, “Mobile robot navigation using the range-weighted Hough transform,” IEEE Robotics & Automation Magazine, Vol.2, No.1, pp. 18-26, 2015. M. Zhang, “A Method of Reference Point Range for Field Navigation of Agricultural Robot,” Int. J. of Smart Home, Vol.10, No.2, pp. 75-84, 2016. P. Patompak, S. Jeong, N. Y. Chong, et al., “Mobile robot navigation for human-robot social interaction,” IEEE Int. Conf. on Control, Automation and Systems, pp. 1298-1303, 2017. 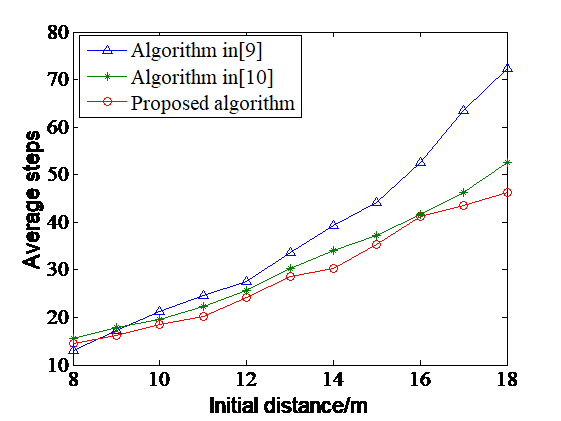 J. Kong, M. Ding, X. Li, et al., “An algorithm for mobile robot path planning using wireless sensor networks,” IEEE Int. Conf. on Mechatronics and Automation, pp. 2238-2242, 2015. J. R. Jiang, Y. L. Lai, and F. C. Deng, “Mobile Robot Coordination and navigation with directional antennas in positionless Wireless Sensor Networks,” Inderscience Publishers, Vol.7, No.4, pp. 272-280, 2011. N. Zhou, X. Zhao, and M. Tan, “RSSI-based mobile robot navigation in grid-pattern wireless sensor network,” IEEE Chinese Automation Congress, pp. 497-501, 2014. V. Raghavan and J. Mo, “Sensor Fusion Based Autonomous Mobile Robot Navigation,” IEEE Int. Conf. on System of Systems Engineering, pp. 1-6, 2015.